Satellite temperature data is now in for December, and confirms, as expected, that 2015 was not the warmest on record, but only third warmest since 1979, well below both 1998 and 2010. Indeed, despite the strongest El Nino conditions last year since 1998, temperatures have barely exceeded 2005. The temperature standstill since 1998 is still evident from the purple trend lines on the monthly anomaly graphs below. There is always a lag before higher SST’s affect the atmosphere, usually between three and six months, but as strong El Nino conditions have existed since last April, it is unlikely monthly temperatures will go much higher in coming months. This assumes, of course, that El Nino does not re-strengthen. I’m sticking my neck out now, but given the current consensus on El Nino, I would expect 2016 to finish slightly higher than last year, at around 0.40C for RSS, and 0.30C for UAH. This would still leave both well below 1998 and 2010. If I am right, this would be quite remarkable, given that the current El Nino is so much stronger than in 2009/10. 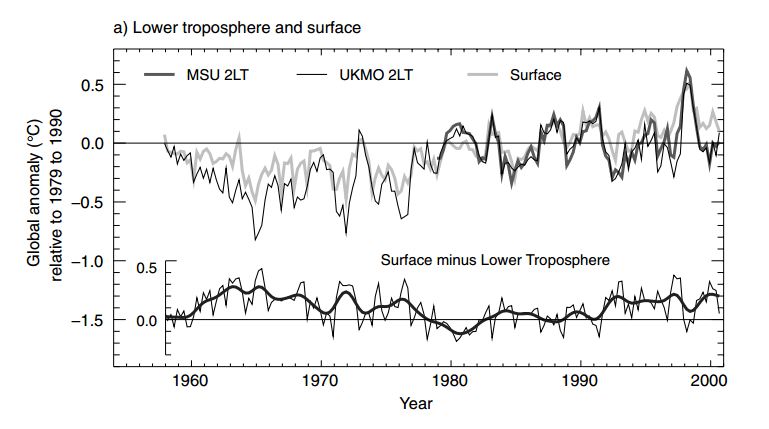 UAH & RSS clearly shows 1998 warmer than 2010 in the satellite record. Well they should be close of course. Am I dreaming but didn’t HadCRUT3 have 1998 warmer than 2010, but HadCRUT4 has it the other way around? Why would that be? How ’bout: It is hard to keep lies straight? If you are right it just might be showing us what natural cooling is doing behind the ENSO process. Well said – we have a “strong” El Nino – whose affect on global temperature is very weak. That strongly suggests we have already entered the long term global cooling that would be expected based on the previous cycle and/or from reduced sun-spots. – and the only reason we didn’t see it last year was because of El Nino warming on top of otherwise cooling temperatures. With El Nino ending and other cooling indicators there’s a reasonable chance that 2016 will be the coldest year this century and that 2017 could be “worse” (not that any of us will actually see anything in our daily lives). So how will the Karlized hadcrut4 behave? Will the anomaly difference between the two satellite TLTs and hadcrut4 surface anomaly keep growing or not? It is truly bizarre that despite billions of dollars on climate research, and the evolution of computer modelling and power overr 25 years, the charts still don’t show clear patterns of temperatures rising or falling over 5 year timescales (let alone 85). I bet in 2013 that 2015 would be the beginning of a 0.4C fall, based on my interpretation of CET patterns since 1930. Obviously I was wrong. But maybe I was off by 18 months, that the post-El Nino temp drop will prove me “right”? I have no idea. It is bizarre that you need sophisticated mathematical algorithms to see any solid, linear temperature rise attributable to CO2. We’re talking about a planet-wide phenomenon that is said to be dominated by A-CO2 since 1950. And yet only modellers and politicians and social scientists can see it clearly. The situation is worse than predicting financial markets. I live in Calgary, Alberta, where the economy is ruled by the oil and gas industry. I have no understanding of why it happens, but there have been recessions due to low prices since I’ve been here – ’75, ’82, ’86, ’94, ’98, 2005, 2009 and 2014. That’s an average of 5.4 years, with a 4 – 8 year range. Every time was for different reasons, but the result was the same. The older boys say it has always been like this. (There may be an internal supportive exploration and development cycle a work, IMHO, as there does appear to be a 4 – 7 year period of a business startup to successful capital stock growth.). The point is, without understanding the reasons, you can reasonably suggest you harvest your money when it starts to come in, because it’s not going to last very long. But when you look at the temperature (and ice) patterns, you can’t discern anything worthwhile by simple observation. You need the math (including what the anomalies are – amateurs with temp observations are simply irrelevant to the self-elected referees of this game). It might be good to have a footnote on this current one. El Niño is not like the metre. In Paris there is a bar of platinum–iridium depicting the length of a metre (Now redefined, I know). Yes, this current El Niño is portrayed as you say, but the ENSO, El Niño, La Niña progression is poorly understood. This is a dynamic thing that takes place in a massive 3 dimensional space. There are several measures of it because specialists do not agree on how best to measure and report on it. It seems many folks had hopes that this one would be the really big event of their dreams. It hasn’t been – as this post documents to this date. I have a sneaking suspicion that this so-called strong el Nino is nowhere near as strong as the climatologists are saying. In fact, what we may be looking at the direct effect of manipulating temperature data to such an extent that the observable reality is grossly out of step with the reanalyzed data.Previous el Ninos showed quite readily in RSS and UAH. That has, of course been totally “adjusted” out of existence. They obviously need a few billion more to spend on models and adjustments to get theright answers.